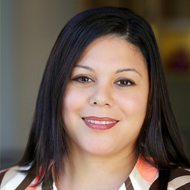 Angie Arismendi is a proud native of Corpus Christi, Texas, and a graduate of Mary Carrol High School. After high school, she moved to Edinburg, Texas to attend the University of Texas-Pan American (UTPA) on a golf scholarship. While at UTPA, she majored in Interdisciplinary Studies. After receiving her degree, she pursued her passion and started her educational career as a classroom teacher with McAllen ISD where she taught for six years. While teaching, she simultaneously obtained a master’s degree in educational leadership from UTPA. In 2006, Angie joined IDEA Public Schools as a 6th-grade teacher at IDEA Quest, and she thrived as a leader among her colleagues. The following year, Angie was promoted to Dean of Faculty and Students where she managed campus operations, culture, and behavior. In 2008, Angie joined IDEA’s Headquarters team where she oversaw the student intervention program for all grades and ultimately ran IDEA’s elementary program. It was because of her deep understanding of IDEA’s elementary school model and culture expectations that she was then asked to open IDEA Alamo Academy in 2010. Since then, Angie has successfully opened IDEA Weslaco Academy and College Prep, IDEA Allan Academy and IDEA South Flores Academy. In 2013, Angie was asked to lead IDEA Carver Academy. Under her leadership, the campus improved significantly from below standard to the TEA’s met standard expectations. In recognition of her tremendous work throughout the years, in 2014, Angie was promoted to Senior Vice President of Schools. Today, she directly manages the principals of IDEA campuses on the Eastside of San Antonio: IDEA Walzem, IDEA Carver, IDEA Eastside, and, one of IDEA San Antonio’s new campuses for 2016-17, IDEA Judson.